Typically, a standard cake smash with us produces upwards of 50 images for you to keep, print & share in glorious high resolution. 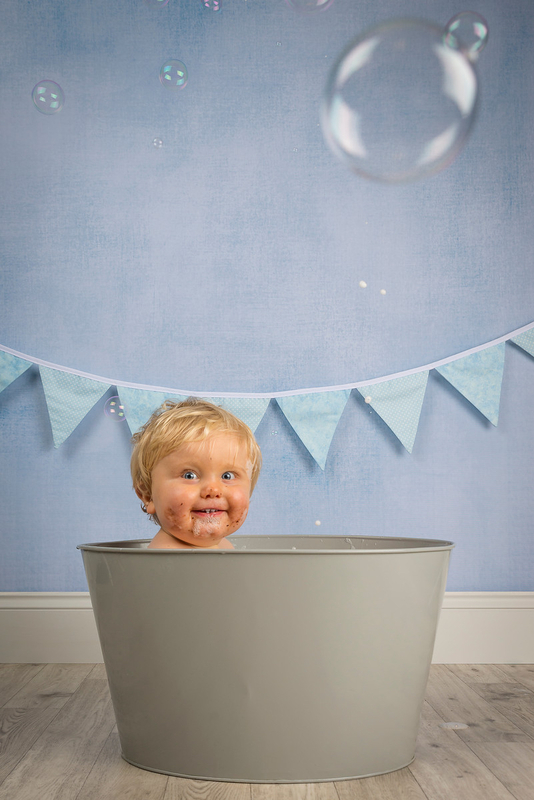 Cake-Smash & Tub-Time can generally double the images we send you. We don't limit this, if we get 120 awesome pics, you get 120 awesome pics! 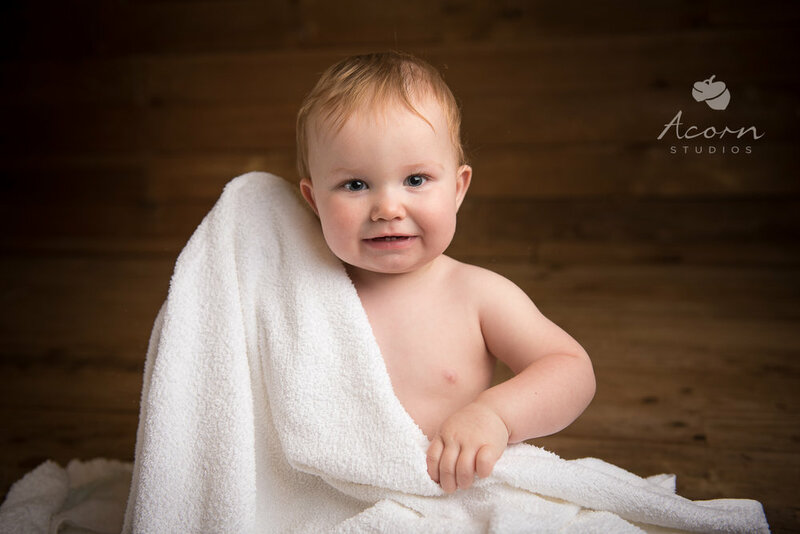 These images are delivered to you via download link within 3-5 days of your shoot. 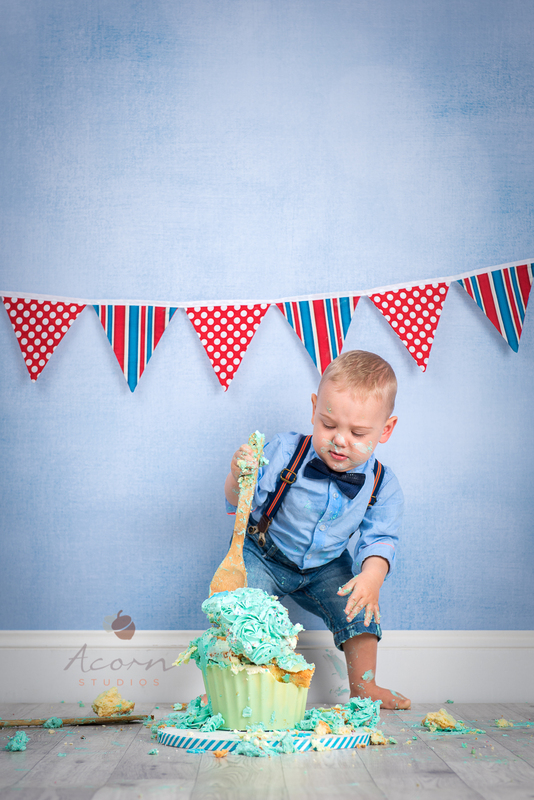 We offer variations on our cake smash themes shoots to suite all budgets. 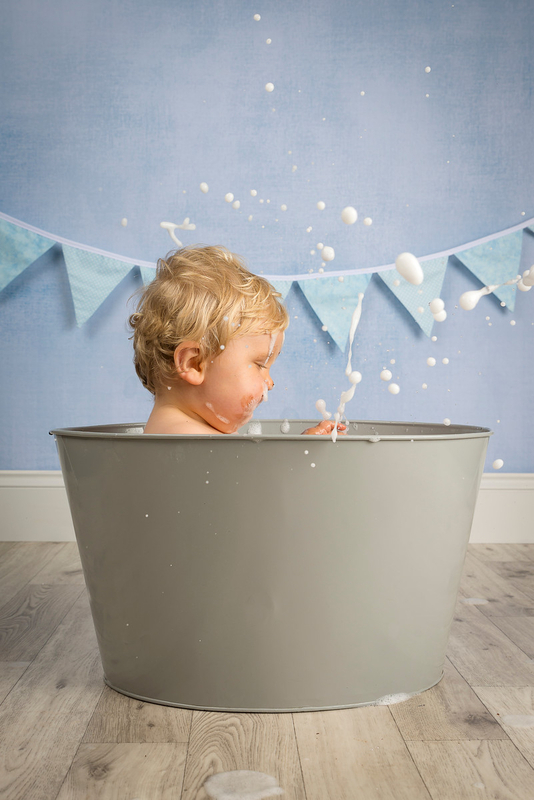 Our straight forward cake smash is just £115 inclusive of the digital delivery of fully processed, hi-resolution images. You bring the cake and the shoot lasts 30mins tops which is more than enough time to capture a messy mash up of child and cake! 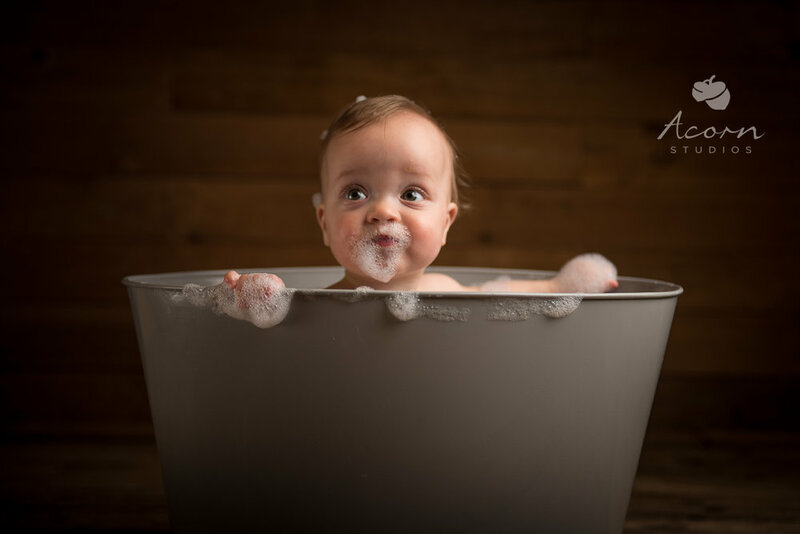 As above, but after, a nice warm super bubbly bath in our classic metal bath tub! We change up the backdrop from white to either our wood background or our lovely Oyster, soften up the lights and shoot away. Add this to your cake smash for an additional £35 (total shoot price is £150 inclusive). 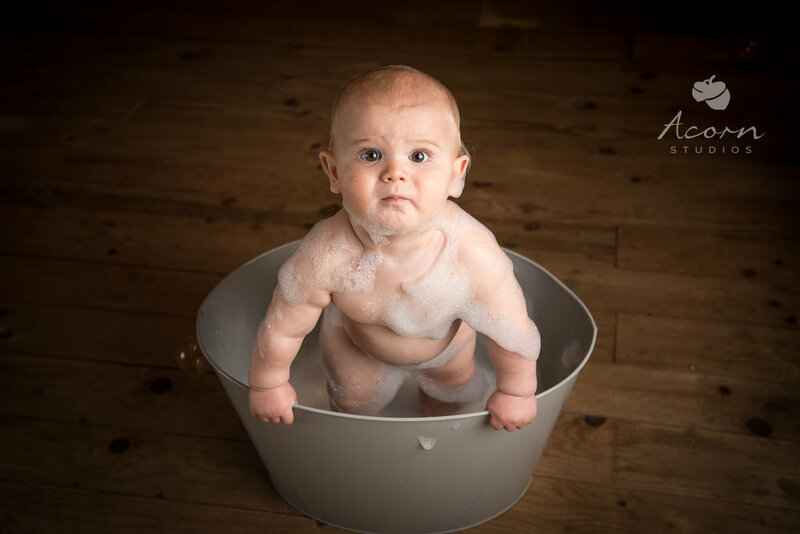 We use Mr & Mrs Matey hypoallegenic bubble bath for all our Tub-Time shoots but you are free to bring your own if required along with towels. This is included at no extra charge. We welcome you to bring your own cake, either shop bought, home made or professionally made. Or, we can supply a giant cupcake from our high acclaimed *local cake maker Louise at Jazzy Cupcakes at £35 per cake (blue or pink). Book that with your Cake Smash and save £5. The cake is made from all natural ingredients and made fresh the evening before your morning cake smash, or the same day for later shoots. For full ingredients lists for giant cup cakes please ask :-) (thanks to Charlotte for permission to use her photograph). Our standard Cake-Smash. You bring a child, we supply the cake! Session lasts around 30mins. As above, but after, a nice warm super bubbly bath in our classic metal bath tub! We change up the backdrop from white to either our wood background or our lovely Oyster, soften up the lights and shoot away. Add this to your cake smash for an additional £35 (total shoot price is £185 inclusive). 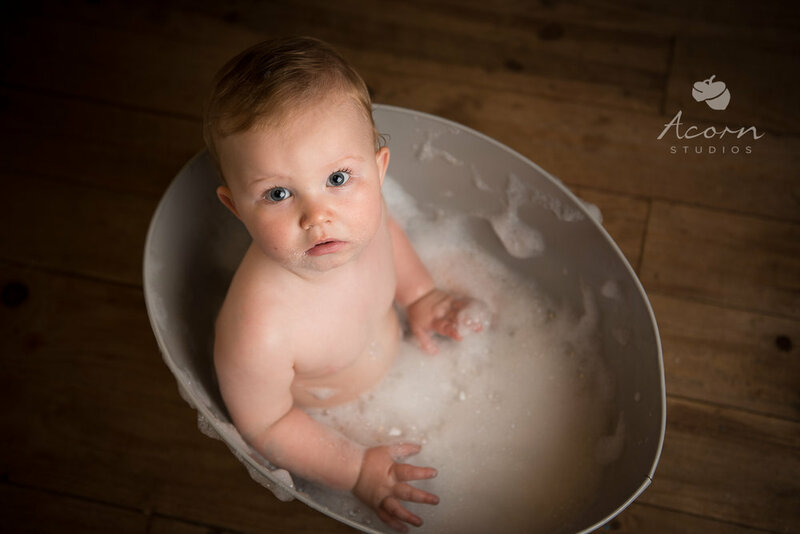 We use Mr & Mrs Matey hypoallegenic bubble bath for all our Tub-Time shoots but you are free to bring your own if required along with towels.